Today is UK Employee Ownership Day (EO Day) 2015, which is now a significant event in the national business calendar, delivered by the Employee Ownership Association (EOA). The sector has much to celebrate, as there has been a major increase in the number of employee owned businesses in the UK. 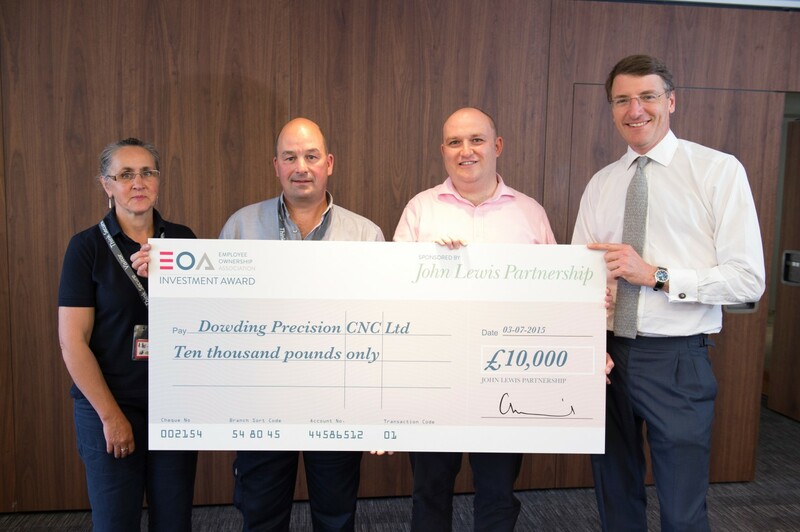 This year saw the launch of the first EOA Investment Award and Dowding Precision CNC Ltd have today been announced as the winners. The Award of £10,000 was been sponsored by EOA member, the John Lewis Partnership, and was open to any entrepreneur who is about to create an employee owned business, whether as a start up enterprise or through the conversion of an existing business. “Dowding Precision are a fantastic example of a small, high tech, high skill, family run business, manufacturing everything from parts for Formula 1 cars to surgical instruments. “Nationally, employee-owned companies now account for over £30 billion of UK GDP. The sector is growing because co-owned companies tend to be more successful, competitive and sustainable; so to see so many companies exploring a transition to employee ownership and submitting awards entries was a positive indication that we will see this growth continue. Employee ownership is a business model in which employees have a significant stake in the company they work for. Employees have a say in how the business is run and directly benefit from its success, but the benefits for individual businesses and the UK economy go far beyond that. Research has shown that employee-owned businesses continue to outperform their non-EO counterparts in terms of productivity and profitability, they survived the recession better, their employees are more engaged and they are seeing consistent and steady growth where others are struggling.